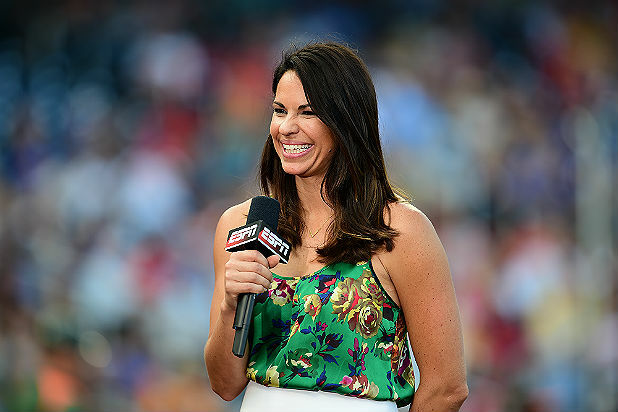 ESPN’s Jessica Mendoza is set to become the first-ever female “Sunday Night Baseball” analyst at this weekend’s L.A. Dodgers-Chicago Cubs game. The gold-medal-winning Olympic softball player will replace former MLB star Curt Schilling following his suspension from the network for tweeting a picture that compared Muslims to Nazis. Mendoza, who is from Camarillo, Calif., will join Dan Shulman and John Kruk in the booth at Dodger Stadium in Los Angeles on Sunday night for ESPN’s flagship baseball show. 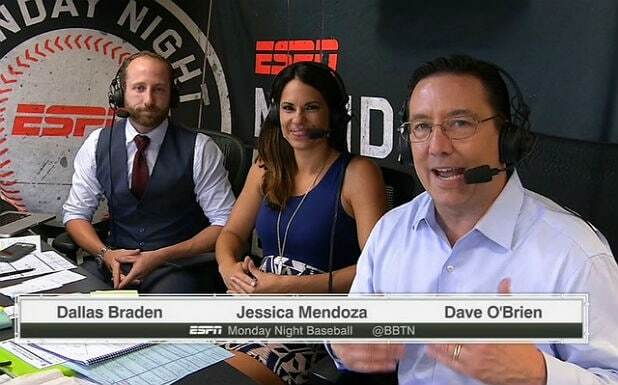 On Aug. 24, she became the first-ever female ESPN MLB analyst for “Monday Night Baseball” announcing beside Dallas Braden and Dave O’Brien (pictured below). Before joining ESPN in 2007, Mendoza was an accomplished softball player, taking Stanford University to the College World Series before playing for the U.S. women’s national team from 2001 to 2010, winning an Olympic gold medal in Athens (2004) and silver in Beijing (2008). ESPN announced Tuesday that Schilling would be suspended after a racist tweet that read: “It’s said only 5-10% of Muslims are extremists. In 1940, only 7% of Germans were Nazis. How’d that go?” he asked. The offensive tweeted was quickly deleted and the network issued an apology.